The Fort Worth city councilman, Joel Burns, did a very courageous thing this week. He spoke from the heart about growing up a gay teenager in Crowley, Texas. Joel described his own experience with bullying and how it almost ended him one day. Joel is the first openly gay Fort Worth councilman in history. I am a Fort Worth citizen and Joel happens to live across the street from me. I am honored to know him and am proud that my hometown, good old Cowtown, has him in service. Joel Burns reached out to gay teens in the community in hopes of preventing another gay kid from committing suicide. As a nation we are seeing an increase in these cases at a time when it seems that people are more progressive on the social issues. Why is that, I thought? You will have your own opinion…but I think mine is a pretty logical conclusion. I think sexuality is a sliding scale….100% queer on one end and 100% straight on the other…..most of the population is somewhere in between. Those underlying feelings….they scare people….when they see gay kids they strike out. The hate and the violence is a product of the deep seated knowledge that the gay kid is not that different than the bully. I posted this week on Facebook that I was taunted in junior high…people were surprised. Why?? I was a teen in the 70s….magnify the homophobia you see now by about 400% and you have life in 1976. I never got to use the water fountain in 7th grade. Every time I bent down to take a drink a kid would walk by and hit the back of my head..forcing it down into the drain. “Dyke!” the kid would yell and everyone around would laugh. And I have blogged before that when I would enter the girl’s bathroom…someone would quite often be there to yell, “hey, a guy is going into the girl’s restroom! !” Compared to the recent news stories, my examples are not that bad….I just remark about them here to make another point. Show me a queer and I am willing to bet they have some bullying stories to tell. Kids jump on anyone that is different, queer kids are an easy target. The young person would be matched up to a local gay professional to show them that IT GETS BETTER!! I think a program like this should be in every high school in America. It is time to draw the line and to say ENOUGH is ENOUGH! One life is too much to lose…let alone the numbers we are seeing on the nightly news. I am going to reach out to Joel Burns and volunteer to assist him in starting a program like this here in Cowtown. Maybe we can be the model for the nation to follow. There was a dark day or two in my early life. When you are a kid and you look in the mirror…there is that day when you come out to yourself. You look in the mirror and see a queer. At that moment you realize it is a part of every fiber in your body, something innate….something that is not going to change. You realize your road is not going to be smooth…you will have challenges and you will receive ridicule. Your life, whatever you choose to do, will be deemed “alternative.” I look at my home and family and I don’t ever think “alternative”….I see love and normalcy. But at that moment when you are 10, 11, 12, 13…..and see yourself truly for the first time….it is scary. These kids that are killing themselves have this realization and don’t see any light at the end of the tunnel. Our job is to show them the light….show them that it gets better! The readers of the blog know that I had a supportive mother. As I was listening to Joel speak this week, I wondered what I would have done if my mother had looked at me in shame or disowned me. I might very well have killed myself. Like Joel said,….he would have missed so much….and so would have I. We have to throw out life-vests to these kids……grab the rope! We have to throw love at these kids and acceptance…..we have to throw out HOPE. Hold tight my young friend….I have walked a mile in your shoes and have turned out fine. Grab hold of life and all that it offers…..WE VALUE YOU AND YOUR LIFE……IT GETS BETTER!! “Remember Juju, don’t take any apples! The man on channel 8 said they are putting razor blades in them to kill kids! !” Juju knew her mother hadn’t seen that on the news, but she responded that she would be careful and off she went. Having already checked herself out in the mirror, Juju was quite proud of the “look” she had accomplished without spending very much money at all. The hat was perfect, the leather vest with the fringes absolutely worked…the only problem was the fake mustache…it was going to be a problem keeping it in place. Charlie, a kid in the neighborhood pointed at Juju and laughed….”you are not supposed to dress up as a man!! You are a girl and should be Bat Girl or a princess Juju!! There were always going to be critics, Juju thought to herself. Her spurs jingled and jangled as she walked up Oak Street to fill her grocery sack. Juju was determined to be the best “Frito Bandito” anyone had ever seen! 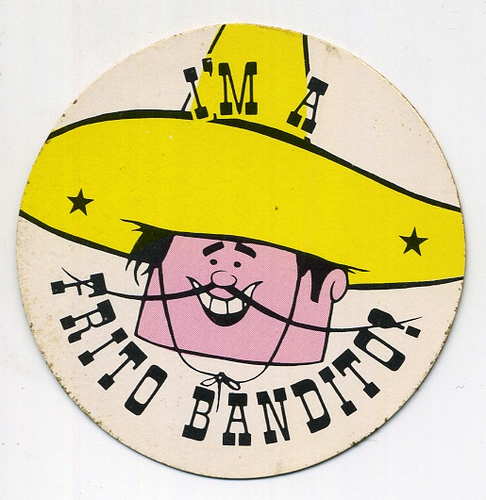 Juju had joined the Frito Bandito Fan Club because she loved Fritos corn chips, but she also loved the character. In her desk at school was the official club badge and a blue Bandito eraser that was highly regarded by her peers. Juju had also won the Harrison Lane Elementary poster contest for third grade that year with an excellent Frito Bandito “WANTED” poster. Her sister Junene had supervised as she took care to burn the corners and give the poster that “old west” look that surely had put her over the top! Juju pulled out her six-shooter and pretended to shoot a couple of neighbor kids as she mozied up to the first door of the night. Mrs. Poteet was well-known in the neighborhood as the “mustachioed woman.” She looked like she was Eastern European and walked everywhere she went. Mrs. Poteet wore heavy hose for her legs, long gloves and a jacket, even in the dead of the Texas summers. The other kids were hesitant to approach the Poteet’s front door, but to Juju…candy was candy, sometimes you had to lay it all on the line….besides, she was armed and sporting a mustache of her own on this night. Juju hit the buzzard and heard footsteps approaching the other side of the door. The door creaked open just enough for a long, slender arm to appear…wearing the black glove. Juju heard a thud hit the bottom of her empty sack and yelled thanks as she ran quickly back to the other side of the street and her friends. “What’d she give ya!? What is it? ?” they all yelled. Juju reached into the bag and pulled out one small box of raisins!! Good grief, Juju thought…not a good start for a Halloween…they moved onward….she would give the raisins to her father, he would eat anything. Juju and her gang of friends went up and down at least 12 streets in the surrounding neighborhoods. Her grocery bag was getting full as she approached Mr. Purcell’s house on the corner of Oak Street and Brown Trail. Mr. Purcell was the high school driver’s education teacher. He and his wife really went “all out” for the kids in Juju’s neighborhood, creating a complete and scary haunted house in their backyard. Juju especially enjoyed the table where Mr. Purcell made you stick your hands into gooey monster brains (spaghetti) and guts (Jello). It was a great ending to every Halloween escapade….Juju decided to head home to categorize her loot. The procedure was the same every year. The grocery bag was dumped in the middle of the living room floor. The candy was sorted into three different categories: 1. absolute favorites 2. trash can 3. crap my parents will eat. Juju’s father had convinced her that Milky Way bars were category 3 as it was an “adult” candy bar. She bought that theory until the age of 12 when she figured out it was just his favorite candy. The peanut butter chewy candy in the black and orange paper were always category 2. 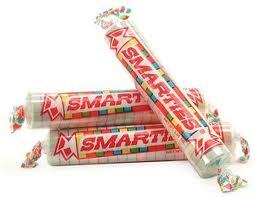 Tootsie rolls and Smarties were sectioned off and always saved soley for the enjoyment of the collector. Juju’s mother always bought double the amount of candy that she needed to pass out….never admitting that she did it on purpose. And coincidently, the candy left over was always Mars bars….her personal favorite. Food was an important part of any holiday in Juju’s household, there was no getting around it. Juju’s sister had just turned 13 on October 15th of that year and had a party at the house with a Halloween theme. Juju’s mother made a huge batch of orange and black sugar cookies for the event, along with smoldering punch and other treats. Juju had done her best that night to pester the group of older girls that were having a slumber party in the den. The prissy older girls ate the pile of orange cookies, but were too squeamish to eat the dark black ones. That was no problem for Juju…..she sneaked into the den on her hands and knees and grabbed the tray of uneaten sugar cookies. Having secured them safely back in her bedroom, she devoured the entire plate with a large glass of milk. The next morning Juju let out a scream and came running out of the bathroom. It seems that there was a problem involving the color black! Juju’s mother, after personal inspection, quickly called Dr. Bullock and in no time she was speeding with her down to his office! The doctor’s first question was what had Juju had to eat the previous night? Juju’s mother stated, “I fed the girls pizza for Junene’s party…and I later saw Juju eating some vanilla ice cream.” Dr. Bullock looked through his glasses, down his nose at Juju and said, “is that all Juju? ?” Only then did the truth come spilling out that Juju had eaten 12 sugar cookies, made with a generous portion of black food coloring. Juju’s mother thanked the doctor for his time and led Juju out of the office.